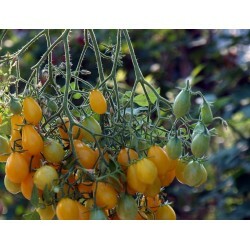 San Marzano is considered by many to be the best variety to make sauce with in the world. 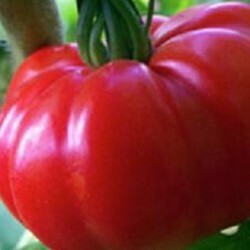 The fruit is thinner and more pointed than that of the Roma tomato; and the low seed density in the fruits, meaty flesh and sweet flavour make this an ideal variety for making tomato sauce. Enjoy in salads with mozzarella, or use in stews. 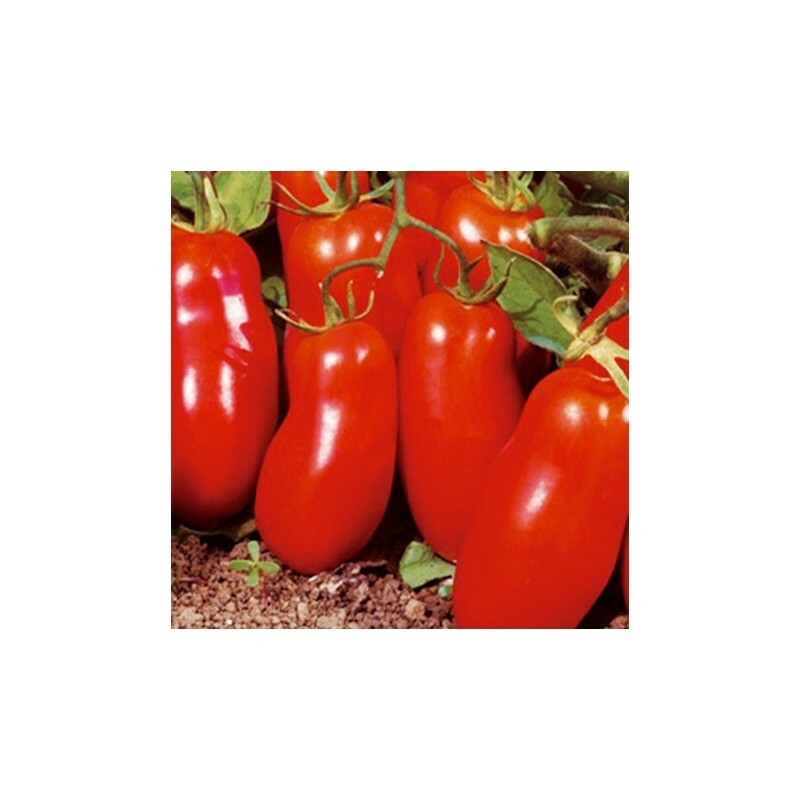 Sow the san marzano tomato seeds about 1 cm deep into a tray or in small pots or cells, covered lightly, watered and placed at between 20 - 25 Celsius on a windowsill, heated greenhouse or propagator suitable for the heat loving seeds. 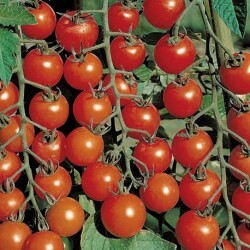 Sow the tomato seeds in the UK for growing tomatoes outdoors late April to plant to final position in June, or February onwards if you have a greenhouse. Germination takes 10-16 days. Try the following if you have trouble with germinating the seeds. Starting tomato plants from seeds is an inexpensive way to have an abundant crop of fresh, vine-ripened tomatoes on hand all summer. 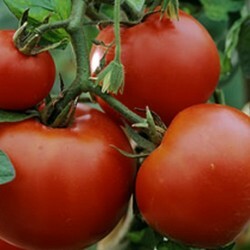 By following these simple 'how to' planting and growing tips, you can have an abundance of tomatoes growing in your garden this year, all started from inexpensive seeds. The first thing to do after you have chosen the tomato seeds is to place them in the refrigerator until you are ready to plant them, which will be 6 weeks prior to the date of the last predicted frost in spring. This chill time prevents the seeds from sprouting until after they have been planted. 24 hours before planting, soak tomato seeds in a solution of weak tea. Take the tomato seeds out of their packs and place in a piece of lightweight cloth. Place each different variety of seed in a different cloth, tie the cloth up and soak the whole thing in the solution of weak, cooled tea. You can use instant tea or tea bags for this seed preparing task, as long the tea is weak and cool. After you have soaked the tomatoes seeds, remove from the tea solution (keep the weak tea solution, you will use it later) leaving them in the cloths, and place them back in the refrigerator. Planting containers can be anything from a store bought seed starter tray to Styrofoam cups and plastic margarine tubs. If you use recycled container like a plastic margarine tub, clean it well in warm, soapy water and poke a few drainage holes in the bottom of the container. Fill the containers 3/4's of the way full with your choice of any professional planting mix, which is readily available at any retailer that sells gardening supplies. Do not use potting soil to start your seeds in, the potting soil is too heavy for the tiny tomato seeds to push their sprouts through. After you have the planting mix in your containers, dampen the mix with water and poke holes in the planting mix with a pencil 1/4 inch deep and 2 inches apart. Remove the seeds from your refrigerator and spread them out on a paper towel to soak up any excess moisture. Using a pair of tweezers, place one seed in each of the holes you made in the planting mix. Cover each of the tomato seed with planting mix and gently press down. Pour leftover weak tea solution in a spray/misting bottle and mist the surface of the planting mix. Place containers on a tray and mist an old towel with the weak tea solution and place the dampened towel over the top of the seed containers. Place the tomato seed containers in a dark warm location in your house for the next 5 days or until tomato seeds start sprouting. Each day, raise the towel and mist the top of the planting mix and the towel with water. Remove the towel and place your seed containers in a southern or eastern window. Mist daily with water and let the tomatoes remain there until the new tomato plants have sprouted 2 leaves, it will then be time to transplant them to their permanent home after all danger of frost has past.